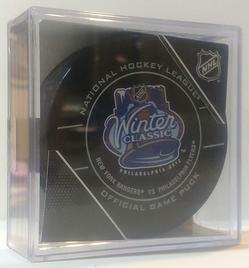 The 2012 NHL Winter Classic was an outdoorregular season National Hockey League game, part of the Winter Classic series, played on January 2, 2012, at Citizens Bank Park in Philadelphia, Pennsylvania. The game, the League's fifth Winter Classic, matched the New York Rangers against the Philadelphia Flyers. The Rangers won by a score of 3–2.